My efforts to identify and locate as many of the some 1,400 Armory Show objects as possible led to some truly exciting discoveries. 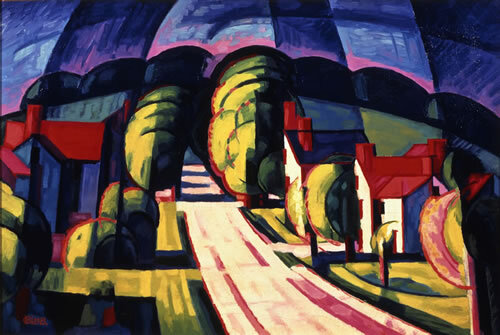 One was an oil painting by the American artist Oscar Bluemner that was exhibited in 1913 as Morning on Long Island. I found no trace of a painting by that title in any of the subsequent exhibitions or publications, or in the artist’s diaries (now in the Archives of American Art, Smithsonian Institution). I contacted the Bluemner experts Barbara Haskell, Jeffrey R. Hayes, and Vera Bluemner Kouba, and while they were all helpful and forthcoming, the consensus was that it was probably not going to be possible for me to find Morning on Long Island. I abandoned the search for several months before a nagging wish to find the painting prompted me to revisit the diaries. Combing Bluemner’s handwritten pages for clues, I found this note: “The Hackensack river yellow houses, the Woodside Morning Hill (20 x 30) oils, hung in the International Exhibition, 69th Armory.” So now I knew that Morning on Long Island had an alternate title Woodside Morning Hill. According to Bluemner’s records, it was the only 20 x 30 inch oil painting of a Long Island morning scene that he made in 1911-1912. A list of his 1911-1912 paintings that appeared on another diary page did not include Woodside Morning Hill or Morning on Long Island, but did include a 20 x 30 inch oil on canvas titled Winfield L. I. Hill. Many of Bluemner’s titles refer to places, and a quick internet search revealed that there is a section of the town of Woodside in Queens, New York, that is called Winfield. It is situated within New York City, at the western end of Long Island. Further examination of Bluemner’s diaries showed that in 1916-1917 he reworked the canvas known as Winfield and gave it a new title, Aspiration. Having abandoned his paid work as an architect to focus on painting, Bluemner was living in poverty at that time and was unable to afford new canvases. Over the course of several months in 1916-1917 he transformed most of his 1911-1912 canvases to reflect his growing interest in the tenets of abstract painting. A lot of his ideas came directly from the avant-garde paintings he had seen at the 1913 Armory Show. Sketches in Bluemner’s diary show how he transformed the more traditionally rendered 1911-1912 landscape into an avant-garde composition that is now titled Aspiration, Winfield. The painting is now in a private collection, and we are very pleased that it will be part of the N-YHS’s exhibition this fall.